Vulcan is a town in the prairies of southern Alberta, Canada, within Vulcan County. It is located on Highway 23, midway between the cities of Calgary and Lethbridge. The population of the town was 1,836 in 2011. Now known as the "Official Star Trek Capital of Canada," Vulcan has a Tourism building made to look like a landed space station, a statue of the Original Series Enterprise, and other Star Trek themed attractions. Vulcan was named by a surveyor for the Canadian Pacific Railway after the Roman God of Fire – Vulcan. Originally, all the streets of Vulcan were named after gods and goddesses of the classical world such as Juno, Mars, and Jupiter. The community was incorporated as a village on December 23, 1912 and then as a town on June 15, 1921. In July 1927, a major tornado destroyed many homes and the new curling rink in the town. That tornado was made famous when a photograph of it approaching Vulcan was used for the "tornado" article in Encyclopædia Britannica. Vulcan once had nine grain elevators, more than any other location west of Winnipeg, making it the largest grain shipping point at that time. Due to the changing economics of the agricultural industry, the original elevators were taken down one by one. 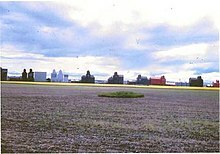 Today, Vulcan has only one of the "prairie skyscrapers" left that once could be seen miles away. Although not original, this last wooden elevator was built in the 1980s. A British Commonwealth Air Training Plan air force base, RCAF Station Vulcan, was located a few kilometres southwest of the town during the Second World War. Many of the old hangars still exist and the runways can still be seen. Vulcan experiences a dry continental climate (Köppen climate classification Dfb) with long, cold winters and short, warm summers. In the 2016 Census of Population conducted by Statistics Canada, the Town of Vulcan recorded a population of 1,917 living in 829 of its 879 total private dwellings, a 4.4% change from its 2011 population of 1,836. With a land area of 6.34 km2 (2.45 sq mi), it had a population density of 302.366302.4/km2 (783.124783.1/sq mi) in 2016. In the 2011 Census, the Town of Vulcan had a population of 1,836 living in 768 of its 865 total dwellings, a −5.4% change from its 2006 population of 1,940. With a land area of 6.58 km2 (2.54 sq mi), it had a population density of 279.027279.0/km2 (722.678722.7/sq mi) in 2011. The town's economy is mainly tourism and agriculture-based. Wheat, canola and barley are the main crops grown in the Vulcan area. Since 1990, Vulcan has hosted the annual Vulcan Tinman Triathlon, which takes place at the beginning of June. This sprint-distance triathlon attracts nearly 1,000 participants. There are classes for adults of all ages and skill levels as well as for teams and children. The town's name has brought some attention that has helped it become a tourist attraction. In the Star Trek television and feature film series it is the name of the homeworld of the Mr. Spock character and his fellow Vulcans. Capitalizing on this coincidence, the town has built a Star Trek–themed tourist station (the Tourism and Trek Station), which provides tourist information, displays Star Trek memorabilia, provides unique photo opportunities, and allows visitors to participate in The Vulcan Space Adventure virtual reality game. Nearby, a replica of the starship Enterprise from Star Trek V has been mounted on a pedestal which includes writing from Trek alien languages such as Klingon. The town has also created space-themed murals and signs, and hosts an annual community-wide Star Trek convention known as "Spock Days". This convention attracts hundreds of Star Trek fans from around the world. The Vulcan Community Healthcare Centre offers emergency and long-term care medical services. The hospital had 5,125 visits for emergency medical services in the 2013/2014 year. More patients are admitted to hospital in Vulcan than in the general Alberta population. [clarification needed] It has eight medical beds with 15 long-term care beds and hosts a medical clinic. ^ "Location and History Profile: Town of Vulcan" (PDF). Alberta Municipal Affairs. October 7, 2016. p. 716. Retrieved October 13, 2016. ^ a b "Population and dwelling counts, for Canada, provinces and territories, and census subdivisions (municipalities), 2011 and 2006 censuses (Alberta)". Statistics Canada. February 8, 2012. Retrieved February 8, 2012. ^ "Location and History Profile: Town of Vulcan". Alberta Municipal Affairs. May 5, 2015. Retrieved May 7, 2015. ^ The Vulcan Tinman Triathlon. "The Vulcan Tinman Triathlon: History". The Vulcan Tinman Triathlon. Retrieved February 2, 2018. ^ a b Pawlowski, A. (August 22, 2013). "Live long and prosper in Vulcan, the 'Star Trek Capital of Canada'". NBC News. Retrieved August 22, 2013. ^ Cernetig, Miro (September 8, 1990). "Small Town Ties Spacey Idea: Vulcan turns to 'Star Trek' to boost image". The Globe and Mail. Wikimedia Commons has media related to Vulcan, Alberta.